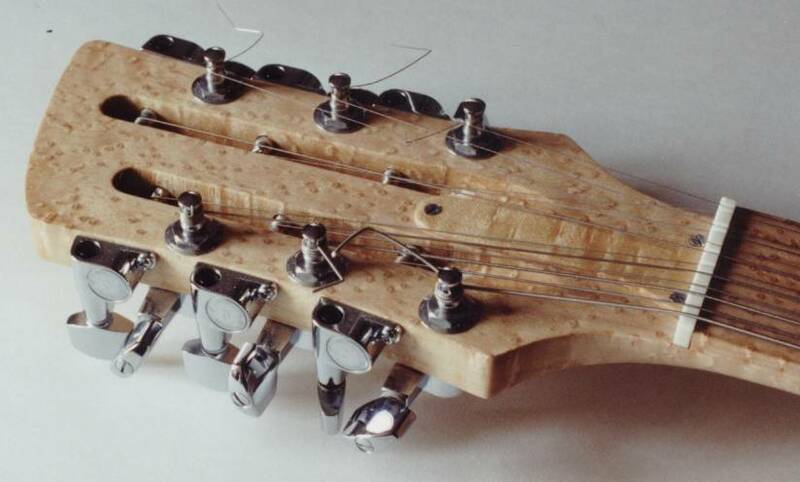 Nothing is quite so special as having a musical instrument made for you. I always listen very carefully to the customer's needs, so that the new instrument will be exactly what is wanted. 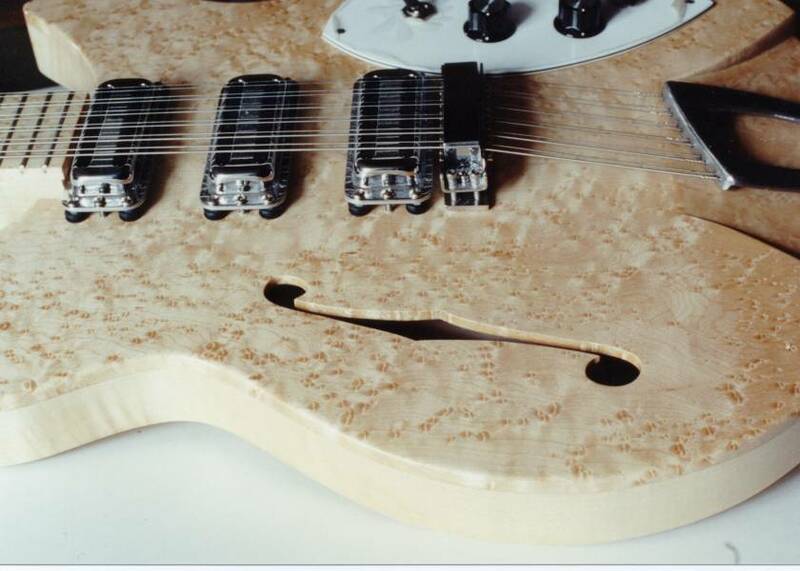 Over the years I have made quite a few customised instruments and the pictures and descriptions below give an idea of what can be done. 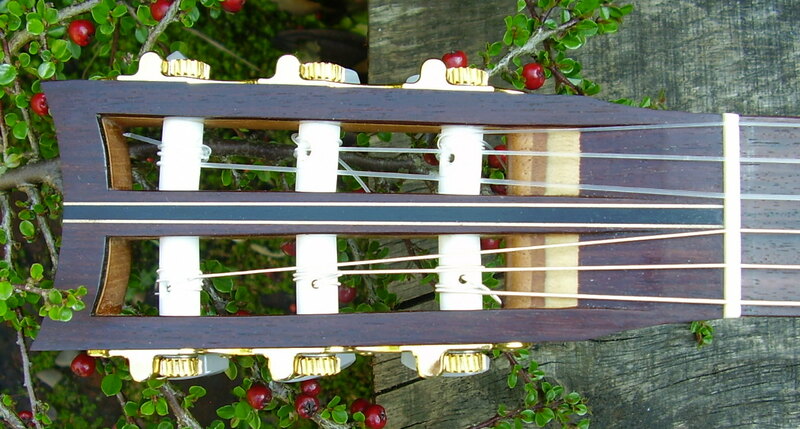 Professional British lutenist, Lynda Sayce asked for a lute which could be amplified for performance. 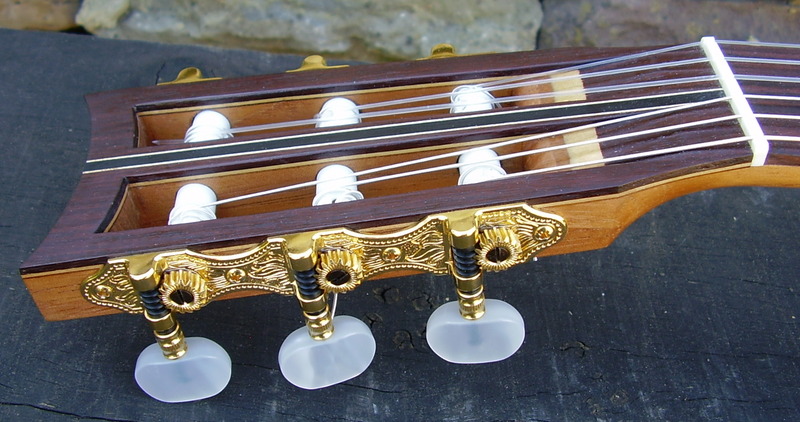 The lute was to plug into an amplifier or mixing desk, as does an electric guitar. It might be used on an outdoor stage and could be subject to dampness. A tiny lapel voice microphone, a DPA 4061 was fitted inside the lute along with its associated pre-amp. Electrical connection was through a mini-XLR jack attached to a stainless steel washer. 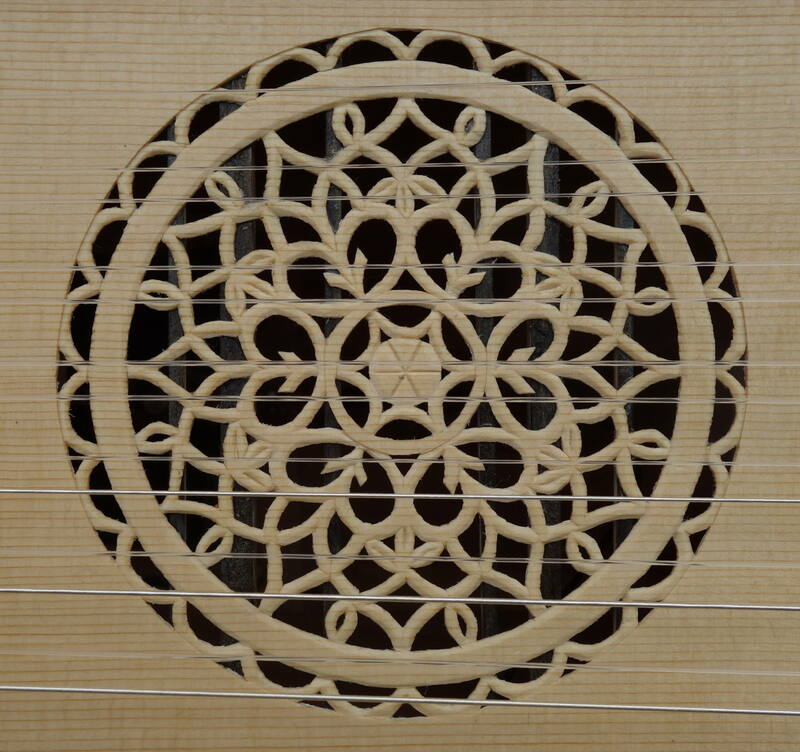 The amplified tone was extraordinarily like that of the lute. 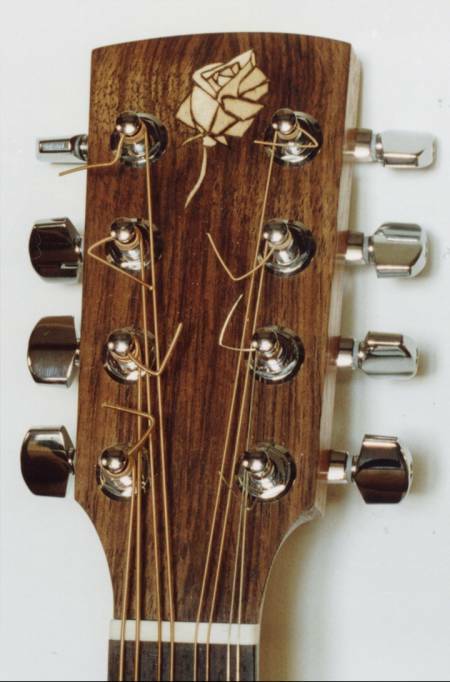 Traditional wooden tuning pegs were not used but were replaced by planetary geared aluminium pegs (Peg Heads) which worked perfectly. 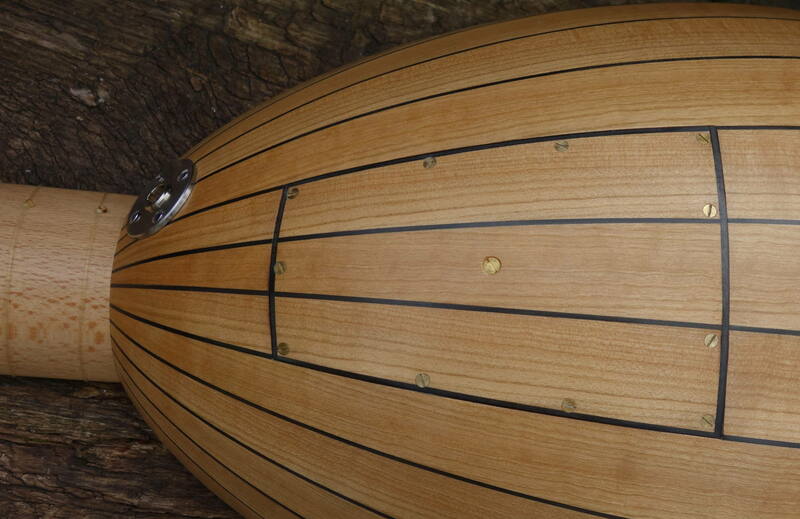 The soundboard was finished with stand oil to make it slightly water resistant. Linda received the lute in May 2017. 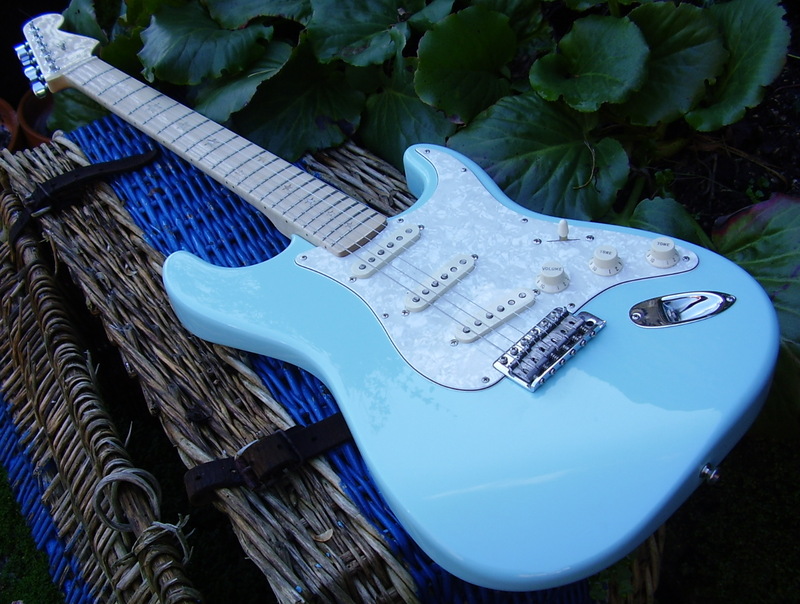 Made for a musician who suffers severe RSI in his left hand, this guitar has a shortened string length (600mm), low tension strings and a narrow neck. The combination allows for a very light and low action. The tone is very sweet and bright. The only loss is projection. As he only plays for himself and his family , projection was not an issue.The shape and barring of the guitar is based on the guitars of Louis Panormo. My client now regularly plays much of the classical guitar repertoire, with no ill effect. 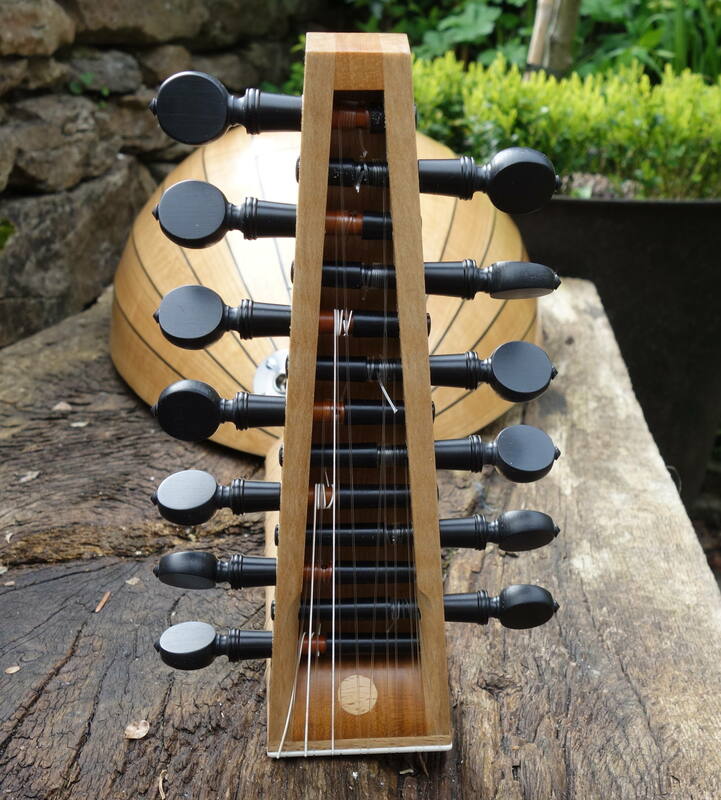 The instrument is a splendid example of what can be achieved by collaboration between maker and musician. Made in 2007and now in Switzerland. 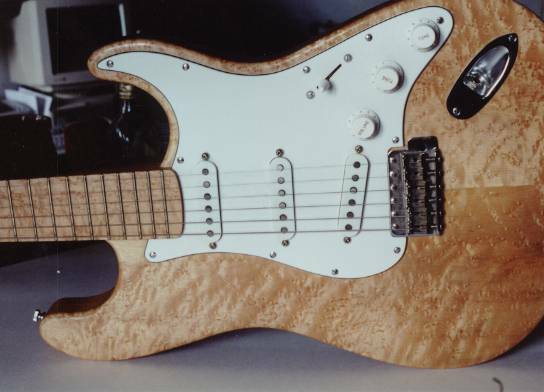 Only the body is original Fender. New pickups, electrics and pickguard were chosen by the customer and installed. 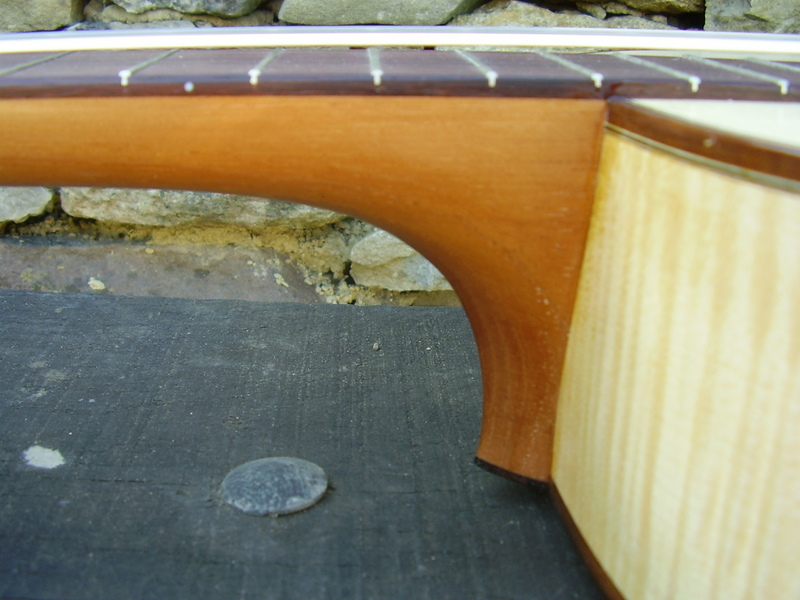 The new neck has a constant thickness from one end to the other, specified radii front and back and thicker than usual frets, creating a type of neck not available from Fender. 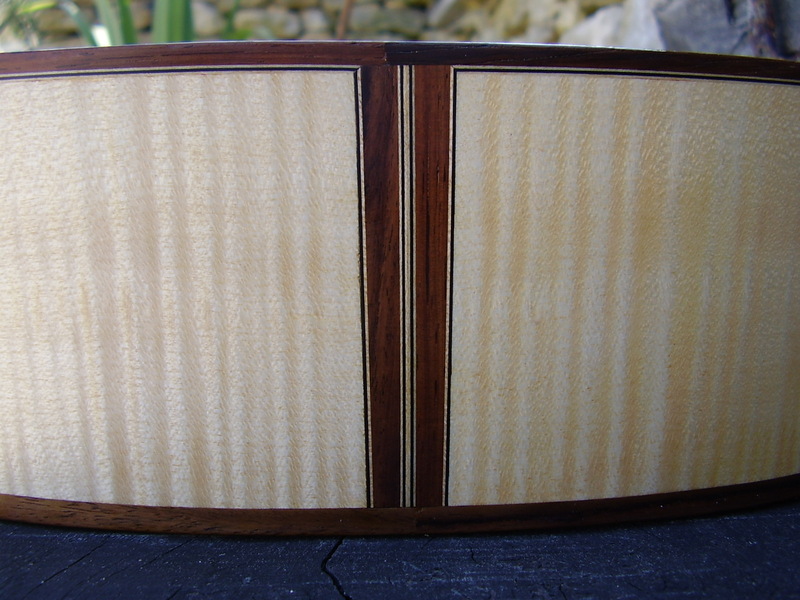 Star inlays were the final touch on this customer's dream guitar. Made in 2006 and now in Crete. 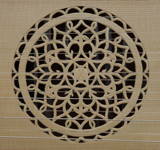 An octave mandola of my own design. 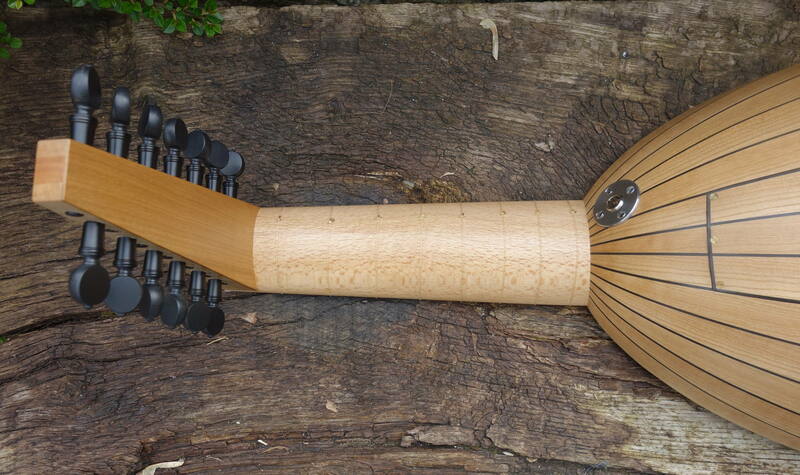 I had been asked to make one but didn't like any of the octave mandoli that I saw, so I designed and made this one. The white rose on the head was requested by the customer. 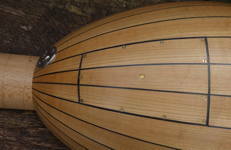 The plan I sell for the octave mandola is based on this instrument. Made in 2000 and still played regularly on the Gloucestershire folk scene. 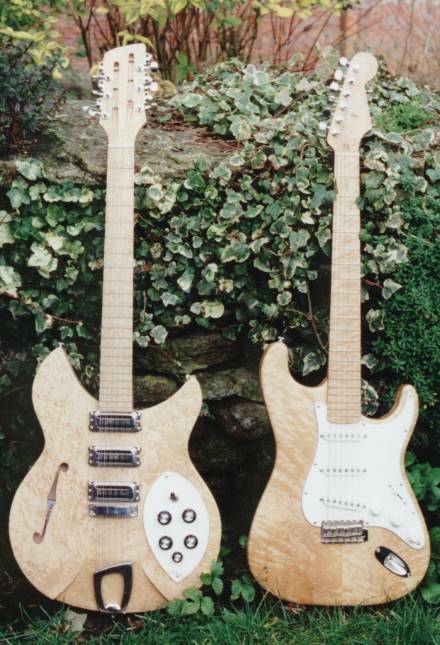 Two guitars for a music studio in southern Gloucestershire, loosely based on a Stratocaster and a Rickenbacker 12 string, have beautiful matching birds-eye maple necks and facings on the bodies. The pickups were chosen and ordered by the customer.